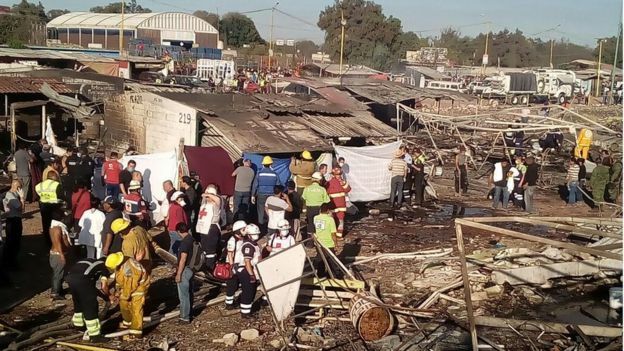 An explosion at a fireworks market outside Mexico City has killed at least 29 people, officials say. Dozens of other people were injured as the blast hit the San Pablito fireworks market, about 20 miles (32km) outside the city. Officials said a number of children were among those who were badly burned, on up to 90% of their bodies. Fireworks continued to explode after the initial blast, as smoke billowed from the area in thick black clouds. “The sound of blasts started to go off and we thought it was a nearby fireworks workshop,” local resident Alejandra Pretel told the AFP news agency. “My neighbours said they felt everything shake, but I didn’t realise because I was running away,” she said. The president of Mexico, Enrique Pena Nieto, tweeted condolences to the families of those who lost their lives, and wished a speedy recovery to the injured. The San Pablito market was heavily damaged by similar fires in September 2005, when a chain of explosions just before the country’s independence day celebrations injured dozens of people.